Launching the first corporate headquarters on the Putrajaya boulevard that houses most of the government ministries this morning, Tun Dr Mahathir Mohamad this morning invited other Malaysian companies, including non-Bumi firms, to set up base there and help make Putrajaya a "truly Malaysian city". 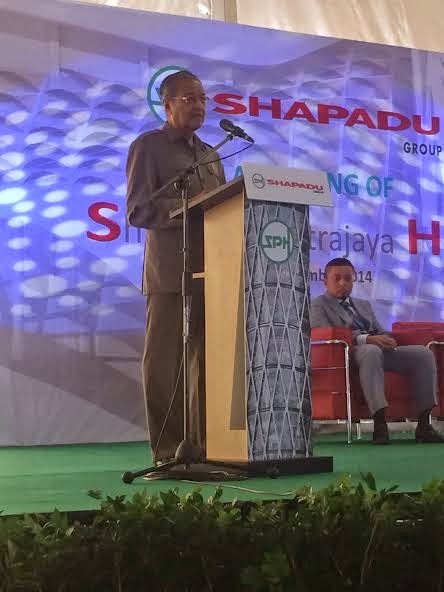 Shapadu Group became the first corporation to announce shifting its headquarters (currently in Shah Alam) to Putrajaya. It will build a RM700 million commercial haven just next to where the Ministry of Finance is. The former Prime Minister, who had conceived the idea of a Malaysian administrative capital in Putrajaya, said in his speech he had never thought he'd live to see Putrajaya reach where it is today. "I thought I would have been long dead. Allah has been kind to me." Sorry to say this repugnant Mahathir is unable to help drive the people to set up bases in Putrajaya any more. It is a ulu and far away town set up by no other than himself. The people are compelled to go there ! By the looks of it, BN will lose the Putrajaya seat by GE16. Kiwi boy n Anon 9.31. The kampong folks are not mistaken at all and Tun Mahathir will continue to be the source of inspiration . As for GE 16 , The kampong folks will extend the wall right into the suburban. We will pray to the soul of MCA n Gerakan then . Meanwhile , lets enjoy the Aljuburi and PasPisPussy drama while we can . Heh, heh - I am thinking that more companies would prefer to set up shop in Singapore. It must be something in their air....or water. Putrajaya vs Singapore... a parochial "backwater" compared to a cosmopolitan and globalised city-state. I thought Putrajaya was set up to be the administrative centre leaving KL to be centre for commerce. putrajaya's success is to be measured not today or tomorrow. it will be in 10 years or so, when klang valley becomes gridlocked. then mahathir will be seen the visionary that he is. can you imagine flying out of subang today? i'm referring to the jumbos, the intercontinental flights. A total failure of Mamakthir and he ends up begging for people to go set up shop there. He thinks businessmen who are not cronies are stupid. He is so scared of being alive to see the abject failure of Putrajaya. Some world statesmen grow old gracefully while their detractors live on to eat sour grapes. I forgot to mention if Putraya is so good why do you have to beg the Chinese to go. Even the Malays are not fools enough to set up bases in Putrajaya. May be before you resigned as PM you should have come up with lots and lots of incentives for the Chinese to set up bases there or even compelled the Chinese to go. Again as I have said these umpteen times before you are still going, every year, to London, why is it because London is the centre of transit to places in Europe and from there you can go, and do your annual auditing, on the ill gotten gain wealth is hidden ! Please don't come up with the excuse you are just trying to promote tourism and also don't forget you have been advocating the people in Malaysia to look East. Why then are you and also taking along your family with you to London ? Are is this repugnant Mahathir going to come up with the excuse that you are trying to negotiate with David Cameron not to bomb the sunni muslims terrorists any more. the sunni terrorists are no better than the Israeli for killing the Arab world like Iraq and Syria ! Anda yang berjaya tak pernah jejak kaki ke Putrajaya? Dato', I see that the dap red bean fa..ts are at it again. Giving their unwanted moronic comments. You are the one who afraid to accept the fact that Putrajaya is one of the nicest capital in Asia... And if you dont have anything nice to say, just shut your big mouth shut, please, it stinks..!!! yet he owns a house worth 7(?) Million and jet sets in style ever so often to kutok the gomen. What are his contributions to Selangor as Economic Advisor? Gaji RM1 but claimed allowances of 12 million during his tenure until he was sacked by TKSI recently. He should have been sacked long ago. Would you care to comment on that? Speak for yourself, charleskiwi. Who or what is repugnant is you and your kind and what you stand for. Name calling doesn't get you anywhere, anon 12.37. It just shows your stupidity and the obnoxious gutter politics you proffessed to. Poor charleskiwi. You really do need psychiatric help. And quickly too. "Heh, heh - I am thinking that more companies would prefer to set up shop in Singapore. It must be something in their air....or water. Putrajaya vs Singapore... a parochial "backwater" compared to a cosmopolitan and globalised city-state. No contest there, bro!" How to set up base in Putrajaya? Najib wants them to set up Base in Iskandar...Set up Base in TRX Jalan Imbi Area. All your comments about Anwar is not enough insofar as I am concerned. May be because you are one with very short memory. I have said a lot, a whole lot more about this lusty Anwar like how the hell is he able to live a live style like what he is presently doing, being chauffeured around, taking his 'coffee boy' abroad just to make him his coffee. Not to mention the hundreds of litigations he has to fund them just to stay around plus many others. The most important question is where is he finding the funds needed to meet these, and where did he learn all these cunningness from and from who ? He must have learnt all these from his mentor repugnant and avaricious Mahathir. The only mistake he made was his impatient to become the PM and also he must have over estimated the support he had behind him. May be all these is the karma that he is entitled to and that he or his wife is not even entitled to be the MB of Selangor. Now are these enough ? Pray God keep Mamakthir alive to see the disasters he has brought on our beloved land. Putrajaya is his classic white elephant. As Far as Najib is Concerned Putrajaya is a Has been that was mooted by Tun M.
He wants to leave his own mark in TRX Tun Razak City KL. The Non Bumis will obviously prefer TRX to Purajaya...More Business Maaaa. So, Tun M ..Eat your Heart Out!! The universal method of developing virgin land is to allow the developer to enjoy the benefits from the appreciation in the value of the land after he has developed it. Land like minerals under the ground do not have value until they become. I remember TDM said that he wanted Putrajaya to be city built by Malays for the Malays. It was to be the only city in Malaysia where there were no non-Malays as other cities and towns were founded or built by non-Malays. Non-Malays were not encouraged to live or do business in Putrajaya. Now he sings another tune. He's growing old and forgot what he had said.